That's a big shame, I really dislike these new LED streetlights. I also noticed whilst passing through Welling in September that some of the side roads off Bellegrove Road have these LED lights fitted too. I've always loved concrete lampposts, even ones like in the picture where it doesn't have its original light - Elder Road in West Norwood had taller versions of the same lampposts right up till the mid 00's but by then, they already had their original lights replaced. Those tall ones in Norwood were similar to the old contrete ones that were in the hackney area, but with different style lamps...theirs having bulbs instead of red into amber tubes. Not sure if Hackney or other areas along the 48 route still have any left, in original condition or otherwise. Sutton council still have a few taller contrete streetlights along their side roads Between Morden and North Cheam, many still in full original appearance. I believe the ones outside St Helier station are still there. The same thing has happened in streets around my area. The New Streetlamps are a lot brighter than older ones. Sutton council still have a few taller contrete streetlights along the side roads Between Morden and North Cheam, many still in full original appearance. I believe the ones outside St Helier station are still there. Ahh yes, that's the dual carriageway road that goes up to Rose Hill - they have some lovely examples along that road. I think the ones in Hackney went in the mid 00's as I remember the ones near Homerton Hospital. 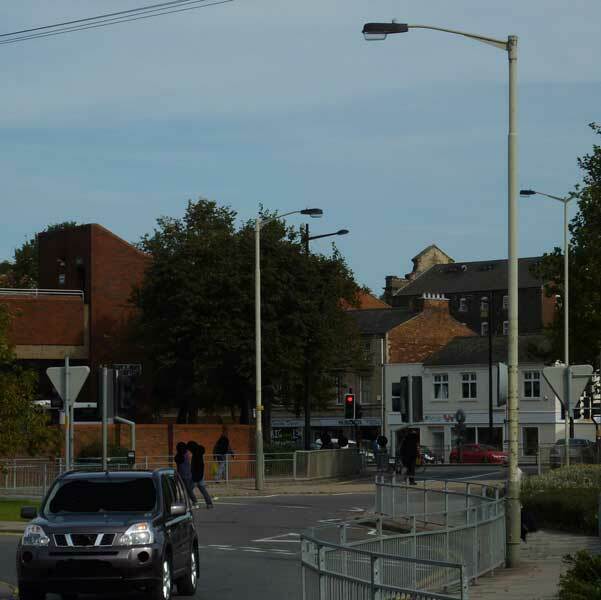 Up to earlier this year, there was a road on the 484 in Brockley that has/had tall concrete columns - some with their original lights and others fitted with Urbis ZX3 lights (the same ones fitted along most of Lambeth's main roads). The Borough of Havering on the edge of London has a large number of concrete columns on the main roads surrounding Romford, most containing Phillips MA lights. The Borough of Hillingdon also has some very old looking concrete lampposts just outside Uxbridge on the U10 route. Not long noticed an old frame lamppost neck still attached to the building on Wimbledon Broadway, by Greggs. Not sure if it still works. I like some LED lights (the ones that have taken over Hounslow look quite sleek), but I really dislike the ones that are on the A41 and A406 (and also in most random locations in London), replacing SOX lights doesn't make me like them more, that's for sure! Industria Arcs are everywhere now as councils apparently find them quite pleasing - Lambeth has lots of boring black Industria Arcs. Lambeth used to have lovely range of lampposts until the mid 00's where there own lighting PFI commenced - we had lots of steel columns painted cream with a red base or white with a blue base and these mainly contained lovely different variations of Thorn Alpha 8's though we had Phillips MA's on Acre Lane, Streatham Hill & Streatham High Road, Thorn Alpha 3's on Denmark Hill, Harleyford Road, Kennington Oval & around the Tulse Hill Gyratory, Thorn Alpha 4's on Norwood Road, Knights Hill & Clapham Park Road & Thorn Alpha 5's on Tulse Hill, Effra Road, Stockwell Road & some unique ones on Central Hill that had a decorative base. All of them are now gone apart from 3 Thorn Alpha 3's outside Oval cricket ground, one Thorn Alpha 8 on Brixton Hill, a few Thorn Alpha 8's on side roads that lead off Streatham Hill & Streatham High Road, one Thorn Alpha 8 outside McDonalds on Westow Hill and some Thorn Alpha 8's on Kennington Road between Kennington Park Road & Kennington Lane. Then we had lots of concrete columns which contained a mix of Phillips MA's and other lights, with Urbis ZX1's joining them during the 90's. Most of the regular street lights from Walworth Road (along Camberwell Road) to Camberwell Green have been refurbished to energy-saving lighting. It basically starts southbound from Argos, which is where the newer Walworth Road streetlights end and the regular (now refurbished) ones begin. So the Urbis ZX2's have been removed? Their original posts are still there but their necks have been replaced with shorter more right angled designs. The areas covered by the borough of Epping Forest still have a good few concrete standards knocking around (mostly Philips MAs affixed but some Thorns too). Also some impressively wonky/sagging ones along the main road through North Ockendon. A few side roads in Haringey have theirs in situ, although in most cases the Thorn Alpha-Ones once common in Tottenham have been swapped for the usual Urbis ZX3s. Salisbury Road and Harringay Road still have vintage low pressure sodium jobbies of varying sorts, though. When we were coming back from Thorpe Park late September there were a few short height concrete lampposts along a particular country road on our way back to the M25. There were few and far in between but was surprised to see that they were still working, most of them were still shining red where they had just turned on. Quite a number of roads within Croydon have both the 1960s and their replacements working. Not quite what I would call energy-saving. 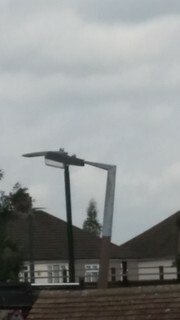 The new lamps are absolutely hideous - no wonder many Croydon residents complained about the old lights going. I will say this - Lewisham's replacement program (which was to run alongside Croydon's program as it's done by the same company) is much further ahead and has been far smoother than Croydon's which, as you mention, has a mixture of roads with old and new lights working as well as other roads where the old lamppost stubs still remain and even some older lights have escaped replacement altogether despite the rest of the roads containing the new, horrid lampposts.